Growing up, cheesecake was a rich and decadent dessert we'd have on our holiday table. But I'm switching things up to enjoy this sweet treat any time of year. It's even easier when I've made it slightly healthier with reduced fat cream cheese. You can lighten the recipe below even more by using reduced fat or fat free sour cream too. For the crust, I made it with almond flour to keep it gluten free but of course, your favorite graham cracker crust works just as well. One thing that I love about this recipe is how light it is texturally. Part of this wonderful texture is the addition of 2 extra egg whites. When whipped with the other ingredients, it adds a lightness that transcends as it pressure cooks. After this lovely cheesecake pressure cooks, it's topped with a thin layer of strawberry coulis before chilling for several hours (overnight is best). So when it's time to cut a slice, don't worry if it doesn't exactly hold its shape perfectly like traditional dense cheesecakes do. Just enjoy how it tastes. That's all that matters anyway! Place trivet into the IP with a foil sling on each trivet handle. 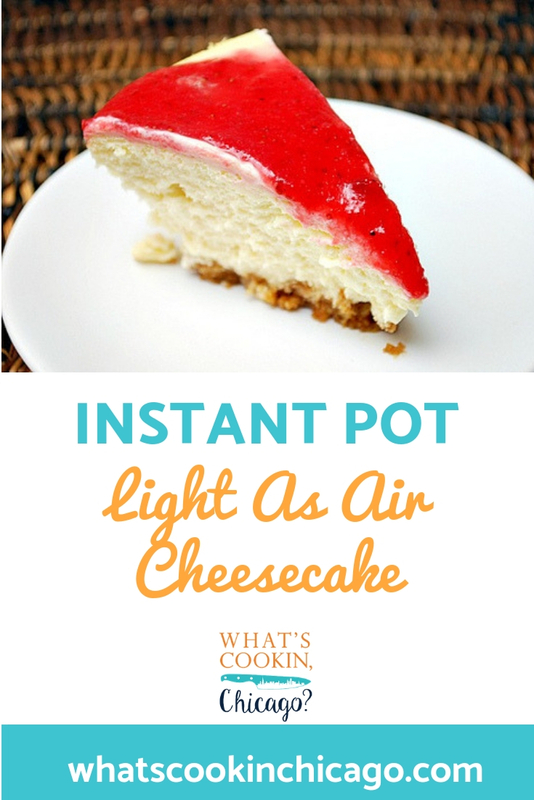 This allows for easily lifting the cheesecake from the IP when finished cooking. Combine the almond flour, 2 tablespoons sugar and butter in a bowl until Press mixture firmly over bottom and 1/2 inch up sides of a 7 inch springform pan. Bake in a 350˚ oven until lightly browned for 10 minutes. In clean food processor, combine sugar, both packages of cream cheese, 1 cup of the sour cream, eggs, egg whites, vanilla extract and flour. Process until smooth. Pour cream cheese filling into crust, filling up to almost the top, leaving about 1/2 inch from the top of the pan - you most likely will have some leftover batter. Carefully place cheesecake onto the trivet set inside the IP. 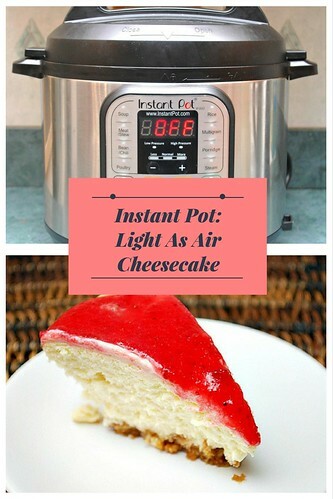 Cover the cheesecake with a silicone lid or with a piece of paper towel and a piece of foil. These will prevent water from getting on top of the cheesecake. If some water does get on top, no worries as it will not negatively affect the end result. Check that it is plugged in, secure the lid of the IP and ensure the valve is set to sealing. Press MANUAL and adjust the time to 35 minutes on HIGH pressure if using a 6" springform pan, or 37 minutes on HIGH pressure if using a 7" springform pan. Once at pressure, the display will reflect 35 or 37 (the number of minutes you initially set ) and will begin to countdown to 0 minutes. When the IP beeps after pressure cooking for 35 or 37 minutes (depending on the size of your springform pan), allow your IP to naturally release pressure for 15 minutes if using a 6" springform pan or 17 minutes if using a 7" springform pan. While naturally releasing pressure, the display will reflect numbers counting up from 1. The numbers indicate how many minutes the IP has stopped cooking since it beeped (or how many minutes it has been naturally releasing pressure). No need to touch your IP for this and allow for several minutes to do so. When the display reflects 15 or 17 minutes since the IP has beeped, turn the setting on top of your IP to venting. Doing so allows the IP to quickly release pressure. I use a wooden spoon to carefully turn the setting to avoid close contact with the potential steam. You may also want to turn your IP away from cabinets to allow the released steam to escape freely. The pin at the top of your IP will drop when all pressure has been released and it's safe to open. Open up your IP and carefully remove the trivet with cheesecake using the foil sling. Set on the counter to rest. Do not remove cheesecake from springform pan. The cheesecake should be slightly loose and jiggle in the middle. 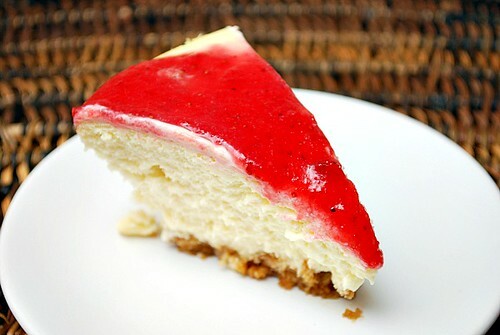 Spread a thin layer of strawberry coulis on top of cheesecake. Cover with plastic wrap and refrigerate until cold (at least four hours or overnight). To serve, remove springform pan rim. Garnish with fresh raspberries or strawberries, if desired.